Alright then, how are you? It's been awhile since I've done an actual book review in awhile. Sure I've been reading a ton but I haven't actually had the time to sit down and think about one. This is a special book review though. Thanks to Fairy Tale Fortnight hosted by the ever awesome Misty from The Book Rat, I am getting my act together and writing some words. I think you all know by now that this is two weeks dedicated to all things Fairy Tales, and I am very happy that I am able to participate in it for the first time! I'm rambling though, and I think it's about time to get to the actual review. I mean that's why you all are here in the first place. 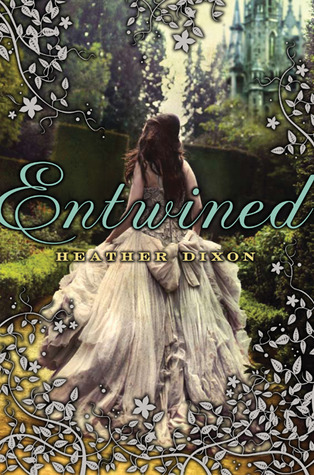 I read Entwined by Heather Dixon. My this was a lovely book, inside and out. I just love it when you're drawn to a cover and a book actually lives up to it. Ms. Dixon did a fantastic job recreating the Brothers' Grimm's classic tale of The Twelve Dancing Princesses, in which the sisters discover a magic passageway in their bedroom and dance at night in a magic pavilion shrouded in silver, kept by, well, Keeper. Let's talk about the characters first. Azalea and her eleven other sisters(who are named alphabetically after flowers by their father the King). Even though there were so many I felt like I got to know them very well, or at least a glimpse a bit of their personalities at some point in the book, although the book focuses on the three eldest girls, Azalea(the eldest), Bramble(the second eldest), and Clover(the third eldest). You witnessed their relationships with each other and the others in the household and the world they lived in develop and grow. What I really liked about the sisters was the aspect of family. Something would happen to get them angry or upset with one another but they would always be able to grow stronger by forgiving and moving on. This also happened with their father(the King) and it was very endearing to see him try to make up to the girls, with however much difficulty, while they are in mourning after their mother's death. Even though this was a fantasy novel I thought it did a good job of addressing some of the issues we face in every day life(love, loss, family). Of course there were the other side characters which were just as nice, or bad, as the main girls. Minister Fairweller, Lord Bradford, Mr. Pudding, Mrs. Graybe, and of course the sadistic, creepy Mr. Keeper who kept the pavilion ready for the girls to dance in at night. My god that man was creepy. Sometimes with YA heroines, they're too daft or mesmerized by the bad guy's 'beauty' to do anything productive until the end of the book. Or not at all. Azalea did a good job of realizing it fairly early on in the novel which made me happy. Also these characters had plenty of flaws. One sister ate too much, another was extremely shy, another couldn't be bothered to put down her books, and I always love reading about characters with flaws because it makes me connect to every one of them, not just the main character, or a certain side character. Let's talk about the plot next. I thought it was very original. There was magic in this novel yes, but it had loads of history to back it up, like explaining how Keeper was trapped in the walls of their decrepit palace that the girls lived in. Though we did not get a full history of their world, but snippets of facts and important people like the evil High King. I'm also not very fond of books about dancing because I feel like I can't see very well what's happening, but I thought that Ms. Dixon did a good job of describing the different moves and things that they did which, of course, was helpful because it was a retelling of the Twelve Dancing Princesses. I liked it that the side characters got a fairly big spotlight at different times in the plot, also. I was rarely ever bored, and I had a lot of those moments where I needed to know what happens next(which doesn't often happen because I'm rather picky with my books). I also liked that love took a backseat in this novel as more of a subplot, not overbearing the whole thing with it's ungodly stickiness that it can often have. Dixon treated it as more of a game than an actual plot line which was nice. Over all I am going to give this 4/5 stars for quirky characters, brilliant descriptions, and a vivid imagination of the world she painted so well for us readers to be immersed in. Great review! You made some great points about the characters that I never considered. This was the first novel I read on my Kindle and I fell in love with this story. It's my favorite fairy tale and the depth of the story telling was so great, I didn't have even one question left when the story ended. I thought love was actually a character in the story, it was kind of the hero. It was definitely the driving force between most of actions in the end. Not just romantic love, but familial love as well. And you're right, Keeper was so creepy and she wrote him so well. You could feel his slick evil as he pushed further into the girls' lives.